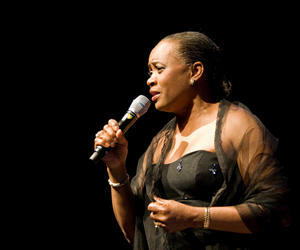 US soprano Barbara Hendricks, who will give a concert on Thursday at the St. Francis of Assis Minor Basilica, told reporters on Monday that she was very happy to be in Havana and sing with Camerata Romeu for the Cuban public. At a press conference, the award-winning performer said to have a very strong emotional bond with Cuba. When I heard about French culture festival in this city, she pointed out; I thought it was the ideal opportunity to present my work. In the presentation, Hendricks will have, as guests, saxophonist Magnus Lindgren and guitarist Ulf Englund, and will be accompanied by Cuba’s Camerata Romeu, conducted by Zenaida Romeu. Scheduled for 6:00 p.m., the concert program includes excerpts from the opera Carmen, with music by French composer Georges Bizet and Les Nuits d'été (Summer Nights) by Hector Berlioz, among other surprises. With more than 14 million albums sold worldwide, she was presented with the Prince of Asturias Award for the Arts in 2000 and has sung in the most important theaters in the world.